In the previous article, I have discussed in detail on How to add your website to Google Webmaster Tool and easily verify it. Now in this article, I will discuss How you can submit sitemap to google webmaster tool. Why to submit Sitemap to Google Webmaster Tool? Before knowing why to submit it. First answer this How can google know about your Blog/Website ? I think you have got the answer, Right? If not, then its fine! Google can only know about your website when you submit the all of your blog url to google and this can be done using submitting the sitemap the google webmaster tool. A sitemap is just an XML file that contains the URLs inside your blog. This file helps crawlers to find all of the URLs of your blog. WordPress XML sitemap also tells search engines which links on your website are more important than others and how frequently you update your website. While sitemaps do not boost your search rankings, it allows search engines to better crawl your website. There are many ways to create a sitemap. At easyseotip, we use yoast wordpress plugin to generate sitemap. We use this plugin because it allows us to optimize our blog posts along with offering many other features. You can also generate sitemap using “Sitemap” wordpress plugin. How to generate Sitemap using Yoast SEO plugin. 1. To generate sitemap using yoast seo plugin, First you need to have yoast seo plugin. If you dont have then just download it from Add new plugin section. 2. After installing the yoast seo plugin. Go to your yoast dashboard and click on XML Sitemap. Note : In the latest yoast version, they have hidden this feature. To do so Go to yoast dashboard and then Features and there you will see a option Advanced settings pages which is disabled. Just Enable it. 3. Now you will see a new option XML Sitemap. Click on that. 4. Once there, enable XML sitemap functionality if it is disabled. When you check the box to enable XML sitemap functionality, WordPress SEO will show you a number of options that you can configure for your Sitemaps. If you are unsure about what to do with them, then ignore them and just click on Save settings. Now you have generated the sitemap. What to do next? 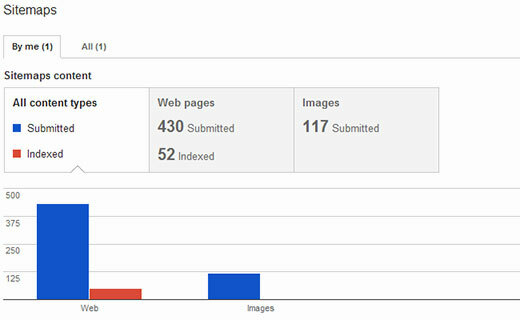 You have to just submit the sitemap to google webmaster tool. 1. First of all, Go to google wemaster tool. 2. And in the dashboard, at the right hand side you will see a option Sitemaps. Click on it. Just submit this sitemap and click on ‘Submit sitemap’ which is in blue colour. 5. Once you have successfully added your sitemap, it will appear as pending. It will take Google sometime to crawl your website. After a while you would be able to see some stats about your sitemap. It will show you the number of links it found in your sitemap, how many of them got indexed, a ratio of images and web pages, etc. That’s it. In this way, you can submit sitemap to google webmaster tool.